It’s not that Mississippi State women’s basketball coach Vic Schaefer doesn’t have sufficient appreciation for The Shot. The floater that tiny Morgan William sank over the outstretched fingers of Connecticut’s Gabby Williams in last year’s NCAA Tournament gave the Bulldogs a 66-64 win, ended UConn’s women’s team’s epic 111-game win streak, and ensured immortality for coach and player alike. He watches a replay of the final seconds silently, smiling, a small grunt of approval as what had been a broken play ended with William seizing the moment. Vic Schaefer gets what that shot meant, and means. It’s hard to see how he couldn’t. But given the choice, Schaefer would rather you know about the shot before The Shot—really, he wants you to understand all that came before it, part of a two-year journey with the same group of Mississippi State players. It wasn’t, and the fact that it wasn’t does much to explain why this particular play meant so much. But it’s not just that, and there’s more to the shot than The Shot. There is, for instance, how precisely Morgan William was built for that particular moment. As Schaefer pointed out, it was a shot she’d made many times before. When Connecticut center Gabby Williams thinks about The Shot, she pictures the ball “three inches above my fingertips.” This was more than simply traumatic—it was an unfamiliar experience for the pogo-stick defensive challenges Williams threw at opposing shooters all season. Connecticut’s unbroken streak of dominance notwithstanding, The Shot is astonishing, and much of that astonishment radiates outward from the physicality of Morgan William getting a shot over Williams, who is 5-foot-11 and whose jumping ability allowed her to play center for a generally undersized UConn team all season. Williams didn’t just step up when asked to slide in out of position, either; she was brilliant, and would be a lottery pick in the WNBA Draft if it were held today, even if her offense didn’t evolve a bit from the adequacy she showed at the end of the ‘16-17 season. Morgan William’s build is a matter of public record, but that raw measurement misses a lot. She’s listed at 5-foot-5, but this is a joke embedded into Mississippi State’s game notes. William is really somewhere in the 5-foot-2 range, and everyone knows as much. Even that may be overstating it. She is somewhere in the neighborhood of the smallest players in the country, and is widely expected to become one of the smallest WNBA players after her senior season, but her reach is an unlikely 5-foot-11. 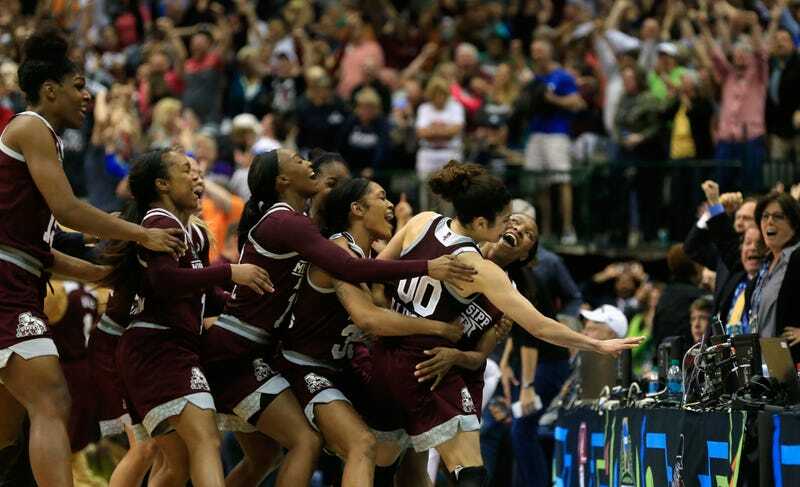 Combine that with a quickness that gets her to the necessary spots on the floor faster than a defender and the pure scorer’s intuitive intelligence about what she can convert to action in real time, and it is clear that William was not quite an underdog in that moment of triumph. All of it was unlikely—not just William getting the shot off, but Mississippi State even being in a position where the shot would matter. But, piece by piece, all of it somehow makes sense. That, and the toughness. Here, again, we are in the realm of things that both do and decidedly do not make sense. William took an implausible 52 charges during her sophomore season, and somehow played most of the year on, no joke, a broken leg. Schaefer credits all that for the fact that William wanted the ball in the first place, in the moment just before The Shot. Keep in mind, Schaefer and I will both remind you here, that Connecticut was the third-best team in the country in defensive efficiency despite playing the toughest schedule of anyone, and had already broken up the play as originally designed. “There’s 12 seconds on the clock, but Connecticut does a great job at taking us out of it,” Schaefer said. “They don’t want Morgan to have the ball. And Dominique [Dillingham] takes just about all the time on the clock to finally get it to her. I would have rather Dominique run high/low and come off the streak and let her take it. She’s a senior. She’s been in that boat. She usually likes to be in that moment. She was trying to get Morgan the ball, and they did a heck of a job denying her of the ball. “But remember at the end of regulation, Morgan dribbled, penetrated, and went to the rim and got it blocked. The kid’s smart. So, this time she thinks, ‘Okay. I’m not going to have that happen again. They’re ready for that,’ and that’s why she pulls up and shoots it from a spot that... she’s made that shot before in big games. Game winners.” In that sense, The Shot was just another shot. In every other sense, then and now, it is anything but. The continuity from that Bulldogs team to this one is not quite as complete. Dillingham and three other seniors now graduated, but the team’s three best players return: William, Vivians, and center Teaira McCowan, who made a quantum leap late in the year. William remembers when Schaefer recruited her, “he was just talking about changing the program to compete. We didn’t really have any fans, nothing like that.” Mississippi State now draws north of 7,000 per game, among the top ten women’s programs in attendance in the country. It’s further proof that women’s basketball can thrive anywhere there’s an administration willing to invest, a coach like Schaefer willing to build, and players like William willing to believe. This year’s recruiting class is Schaefer’s best yet. Schaefer knows that if he does nothing more in a career that has included a huge number of rebuilds and includes work on a Texas A&M staff that won the 2011 NCAA title, he will still be remembered first and foremost for being on the sidelines as William’s shot fell through the net. And yet, because that came in the Final Four—and because Mississippi State lost to South Carolina in the national final—he has built a narrative for both himself and his team. Taking that final step, he said, “drives me. It is kind of the last thing, I guess. But if this is as big as it gets for this Mississippi State team, both Schaefer and William sound like they’re at peace with it. Schaefer has traveled throughout the state to talk up his program, speaking before groups large and small, spreading the word and ending his speeches with his trademark “Praise the lord and go Dawgs.” He has always been a women’s basketball evangelist, but now the crowds assembling to hear the good word aren’t so small. Schaefer once praised Auriemma for inviting him to practice and telling him all he knew. Now coaches are calling Schaefer, asking for a look at his playbook. The goal, all around, is to recreate those seconds that people will be watching for as long as there are fans of the game of basketball—a play that Schaefer didn’t draw up, and that no one could quite have foreseen. William smiles when she thinks of the seconds following her shot, even though she says that she remembers very little of it. She knows Auriemma approached her with gracious words, but cannot remember what they were. She can feel her teammates pummeling her, then lifting her into the air, but doesn’t remember details of how it happened. “So, she was comfortable,” Schaefer said. “She can get to her spot on the floor. She felt confident that she could make that shot, and that’s what the kid did. It’s a great shot. I wish I could tell you it was some pretty, beautiful play we ran, but they took us out of the play I wanted to run. She had to go make a play. That’s what great players do.” It’s all true, but it’s also only part of it. This is the burden of great teams, and great players. They do it, and then they have to do it again.